Funny cat quotes will surely put a smile on your face. If you need a dose of feline humor, you’ve come to the right place. You will find here a compilation of funny quotes about cats. 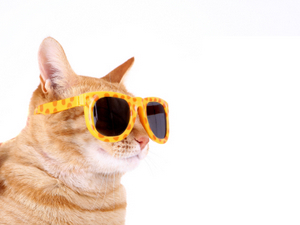 Cats are not only mysterious and cool, they are some of the funniest animals around. Meow is like aloha - it can mean anything. ~ Hank Ketchum. To find more topics, please use the search box below. I hope you enjoyed this collection of funny cat quotes. For more cat quotes, please visit the pages below.